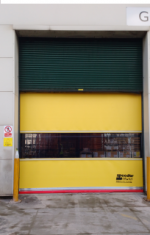 HART DOOR SYSTEMS reports it has supplied GT Emissions Systems, Peterlee, with a Speedor Super that has been fitted behind a roller shutter in its warehouse area. GT Emissions is at the forefront of the design, validation and manufacture of exhaust gas control valves for on and off highway vehicles. Hart Door Systems says its Speedor was installed to retain heat within the warehouse and to prevent cold air and dust entering the building.